When you think of childhood, you probably think of recess, playgrounds, and fun – not hospitals, medicine, and doctors. Nobody wants to hear that their child – or any child – has cancer. But luckily, there are real-life superheroes out there helping, like St. Baldrick’s Foundation. St. Baldrick’s is the top private funder of childhood cancer research grants in the world. They’re also, as they put it on Instagram, that “crazy head-shaving charity” that hosts head-shaving events and works with the superheroes in lab coats to find the best cancer research to donate to. They’re doing everything they can to help take childhood back from cancer, and now they’re doing it in style. 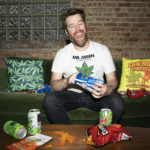 After hosting a design challenge on Threadless to find an amazing design for their Artist Shop, St. Baldrick’s launched a Shop that’s helping the foundation one tee (or mug) at a time. 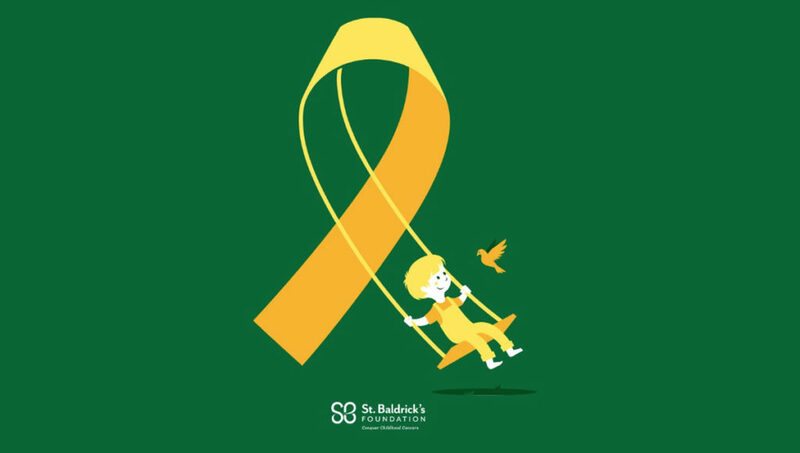 September is Childhood Cancer Awareness Month, and St. Baldrick’s has provided an easy way to help be a hero to kids with cancer this fall. Check out the interview with the challenge winning artist Vincent Caduc and with St. Baldrick’s, then be sure to visit the St. Baldrick’s Artist Shop. If we can make great together, we can help make a difference together. First things first, tell me a little about St. Baldrick’s! 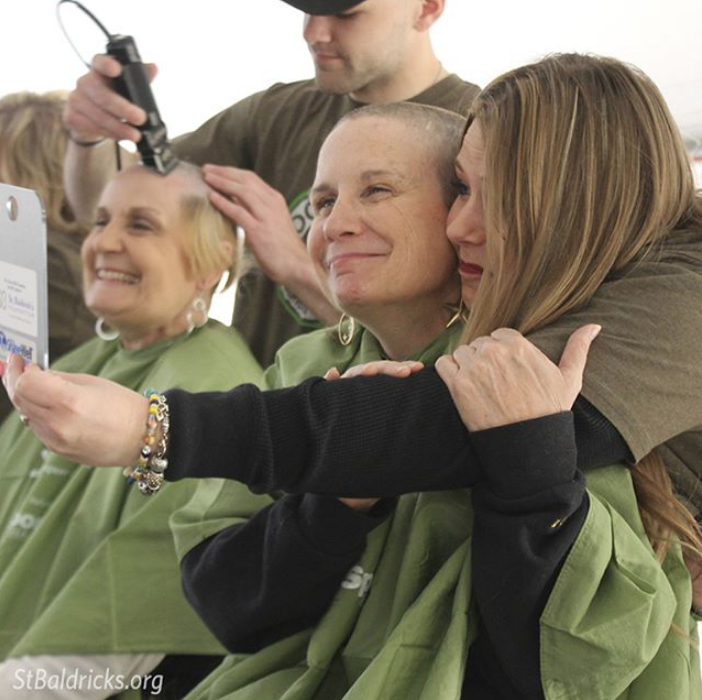 How does St. Baldrick’s help kids fighting cancer and their families? ST. BALDRICK’S: It all started in 1999 when three friends decided to shave their heads to raise money for childhood cancer research. 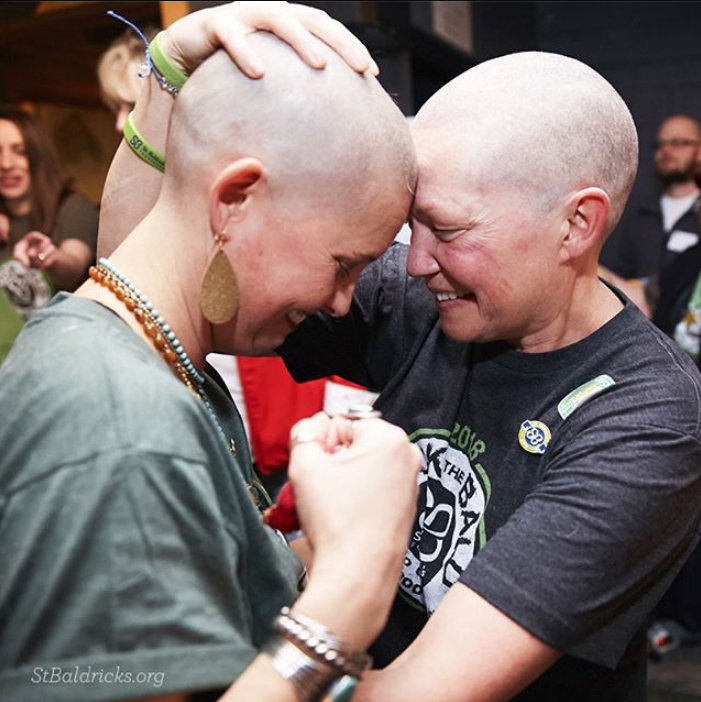 That first St. Baldrick’s event took place at Jim Brady’s Bar and Restaurant in New York City, and St. Baldrick’s has since grown into the top private funder of childhood cancer research grants in the world. Every two minutes worldwide, a child is diagnosed with cancer. Treatment is a long, hard road for kids and their families, and the side effects can last a lifetime. And in the end, not all kids survive. 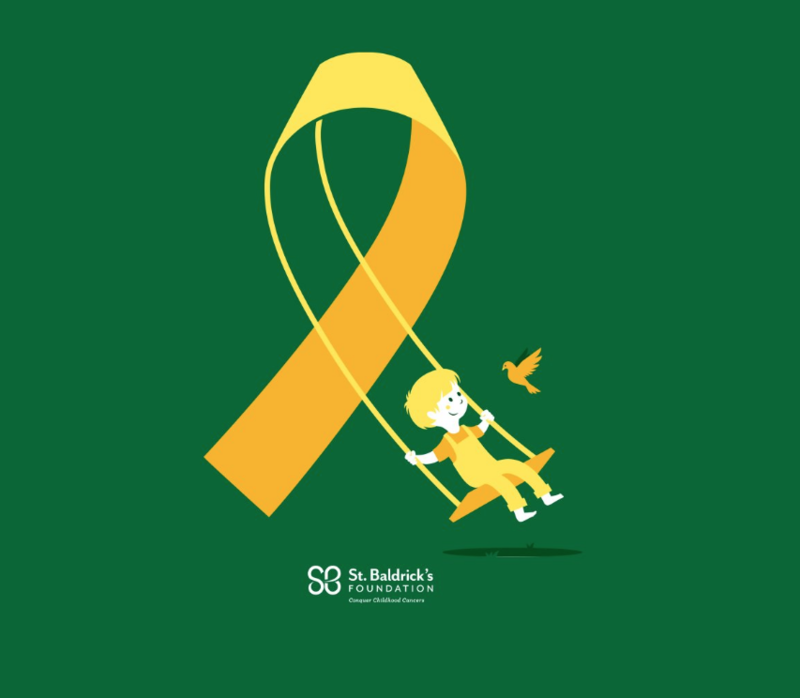 Childhood cancer is a heartbreaking, ugly reality and the St. Baldrick’s Foundation is here to change it. We are here to give kids and their families better treatment options and more hope. 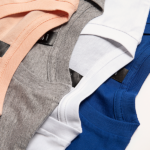 Men’s Extra Soft tee in the St. Baldrick’s Artist Shop. I’m sure you’ve heard a lot of happy stories from people have been helped by St. Baldrick’s. Can you share one with us? 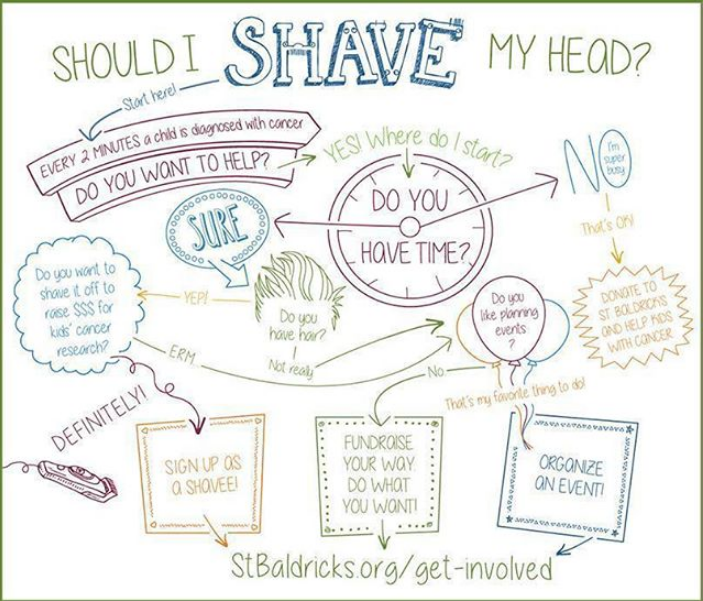 ST. BALDRICK’S: Yes! As you may know, September is Childhood Cancer Awareness Month and we kicked it off with a special feature on one of our Honored Kids, Micah. Diagnosed with an aggressive form of neuroblastoma as a toddler, Micah is now celebrating four years with no evidence of disease thanks to childhood cancer research. 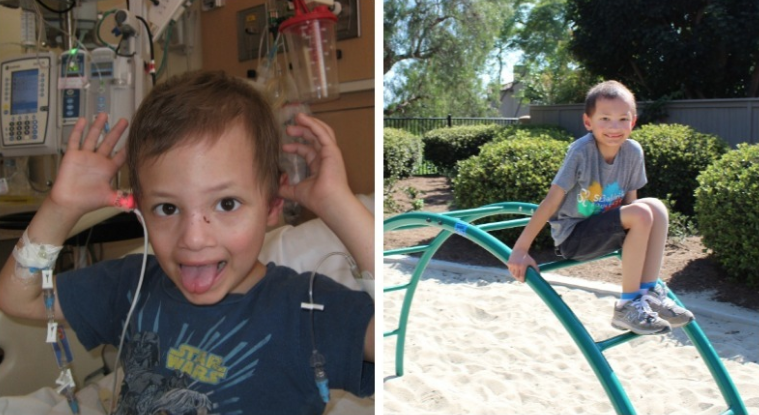 Micah and his family consider themselves lucky because they had options. When you’re in the childhood cancer world, these options include clinical trials, which are crucial to the discovery of better, less toxic treatments. 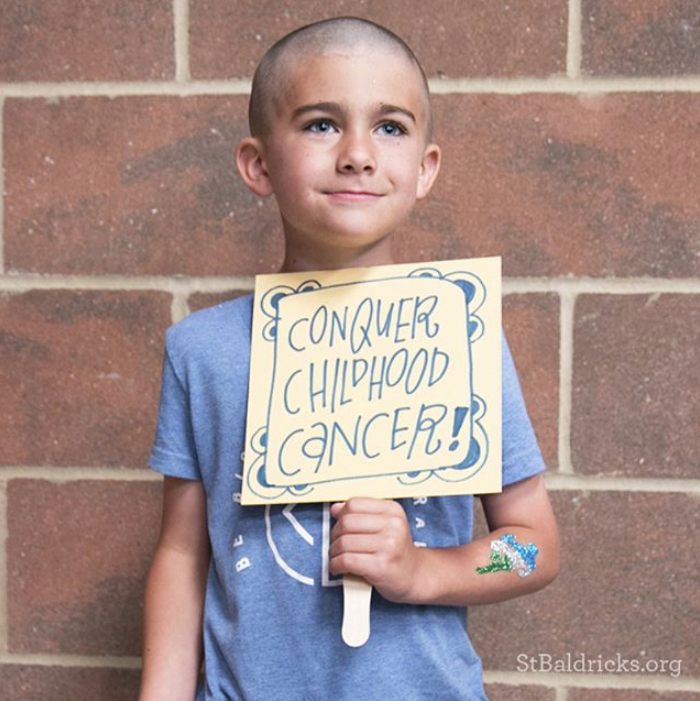 Over the years, St. Baldrick’s has supported more than 260 clinical trials, treating over 104,500 kids at more than 230 institutions. Micah has been on five different clinical trials and he continues to defy the odds because of this lifesaving St. Baldrick’s-supported research! I still have scars and other reminders, but other than that, I feel like I didn’t have cancer at all. I’m really grateful to everyone who works with cancer kids and who helps to make kids like me cancer free. We did a design challenge to find the design you now sell in your Artist Shop to support what you do – what were you looking for in terms of the design for the winner of this challenge? 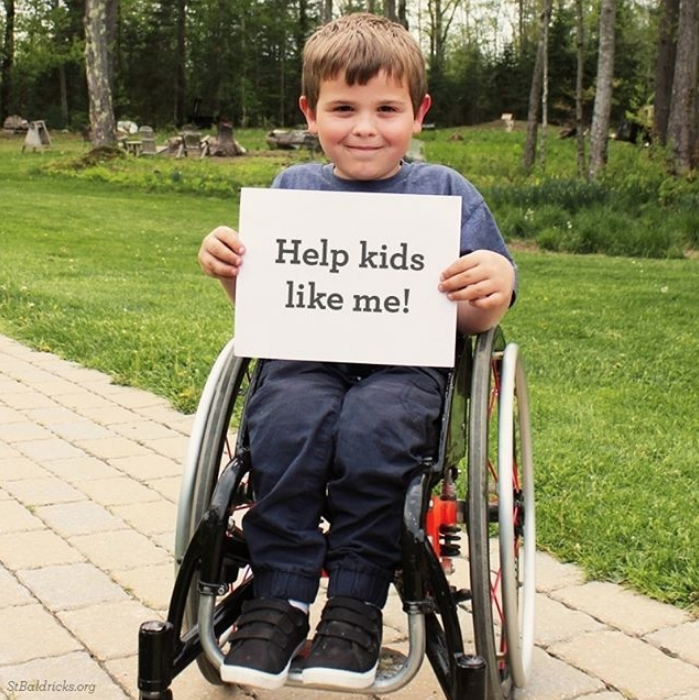 ST. BALDRICK’S: At St. Baldrick’s, we want kids with cancer to get back to just being kids. 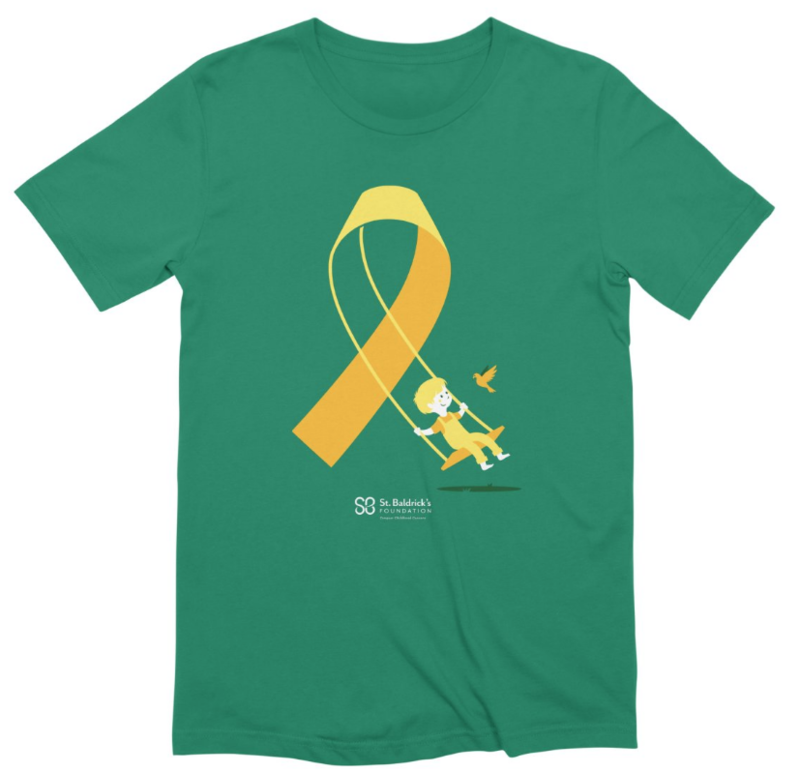 So, when it came time to select the winner, we mainly wanted a design that celebrated the goal we all share – to take childhood back from cancer. That’s why we looked for a design that truly embraced the joy and hope of childhood, while also raising awareness of childhood cancer. At the end of the day, we were thrilled with the gold ribbon and the playful spirit of the child swinging. It’s a design that radiates hope for a cancer-free future for all kids. VINCENT: I was looking to create something from the ribbon shape. It may look basic and simple, but this specific shape was a strong starting point. Thinking of the childhood part of the design, I remember asking myself: “what made me happy in my own childhood? What thing, except drawing, made me feel good and forget the rest?” The answer was pretty simple: being outside and playing around. Then, the connection between both parts was quick, and the ribbon slowly became a tiny playground. It started as a slide but the swing was a better option to me, and more in line with the loop of the ribbon. Few sketches later, the final version was here. WIP images showing how the final “Hope & Happiness” design came together. Victor, you say in the design description that you see the cancer ribbon as a loop that can change direction – how do you think art can change someone’s world? VINCENT: Art has the power to create an alternative reality to anyone’s daily routine, speaking straight to our senses and our feelings. It’s a way out to a world where anyone feels good and can get highly inspired. When you feel this way, you can move mountains, and even one day inspire other people. 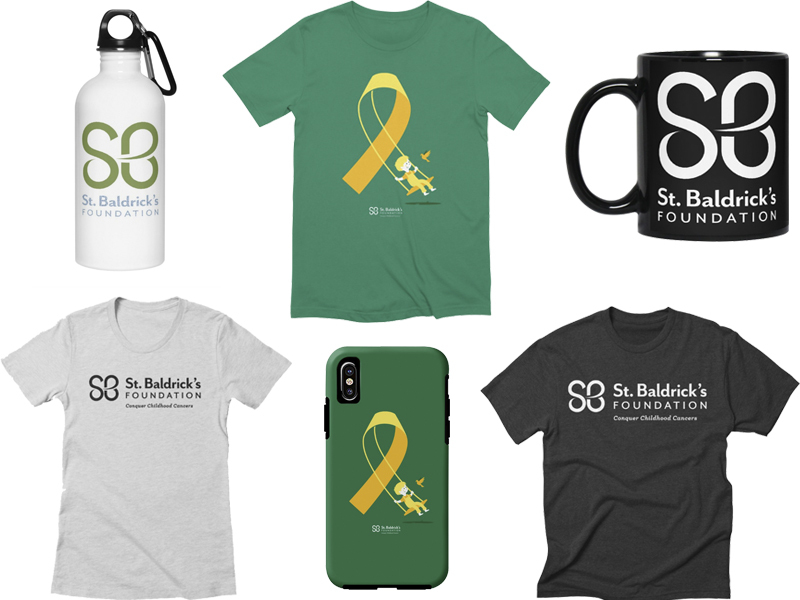 Just a few of the designs & products in the St. Baldrick’s Artist Shop! 35% of the proceeds from these products will go right to St. Baldrick’s to help fund lifesaving research. How will proceeds from the St. Baldrick’s Artist Shop help take childhood back from cancer? ST. BALDRICK’S: 35% of each item sold from the Threadless store goes straight to St. Baldrick’s to help fund lifesaving research! That means you can be stylish AND be a hero to kids with cancer. To us, that’s a winning combination. 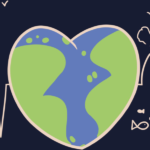 Have you ever done a design that donates to a cause like this before? VINCENT: No, this is the first one, and I’m happy that it can help such a good cause. Nothing matters more than children and we must do everything we can to help them to fight against cancer. 35% of each item sold from the Threadless store goes straight to St. Baldrick’s to help fund lifesaving research! That means you can be stylish AND be a hero to kids with cancer. What’s your creative philosophy as an artist? VINCENT: Accepting the failure as a part of the creative process, and learn from it. Bob Ross said it best: “There are no mistakes, only happy accidents. The head-shaving events you host are amazing and so unique! How do those work! ST. BALDRICK’S: It really goes back to that first friendly dare: would you shave your head to fund kids’ cancer research? That bold act of baldness has gained major momentum since its start. There are now thousands of head-shaving events taking place around the world! It’s easy to get started. After deciding to shave, you can use our online international locator to find one of our signature head-shaving events. They’re held everywhere from pubs, restaurants, schools, churches, and parks to firehouses and military bases. If nothing is locally available, you can even attend virtually. From there, you can create your customized participant page. Then start spreading the word and raising funds. Finally, sit back in that barber’s chair and enjoy the entire event, because there’s honestly nothing like it! St. Balddrick’s ambassador, Kellan! Via Instagram. Not up for shaving your head? That’s OK! You can volunteer to organize an event, help out as a volunteer, or shave heads as a barber. 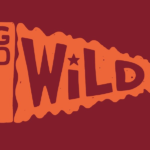 You can also fundraise for kids’ cancer research through our Do What You Want program, which is exactly how it sounds! You can bake cupcakes or ride your bike across the country or embark on an epic hike. You can do whatever you want to do and help conquer childhood cancer at the same time. Whatever your talents, St. Baldrick’s has a place for you. Take childhood back from cancer! Posted in Blog, Spotlights and tagged charity, charity Artist Shops, childhood cancer, donate, fundraising, head shaving events, St. Baldrick's. Bookmark the permalink.